Make sure the DHEA supplement you take passed our tests and is right for you! DHEA is a controversial hormone supplement touted for anti-aging effects, with many other potential applications. But what can it really do? How safe is DHEA and what are the potential side effects? And which products deliver the DHEA they promise? ConsumerLab.com answers these and other questions in its most recent DHEA Supplements Review. 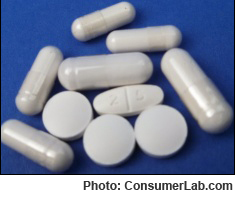 ConsumerLab.com identified a number of products that contained the amount of DHEA claimed on the label, but found that recommended servings sizes varied by about 2,000%! The cost to get an equivalent amount of DHEA varied by as much as 500% among products. Products were also tested for contamination with lead, cadmium and arsenic, and tablets and caplets were tested to be sure that they could disintegrate properly for absorption. You must subscribe to get the full test results for DHEA supplements along with ConsumerLab.com recommendations and quality ratings. You will get results for five DHEA supplements selected by ConsumerLab.com and for five others that passed the same tests through our voluntary Quality Certification Program. Also included are two supplements similar to another that passed testing but which are sold under a different brand name.